A Dentist Gives 6 Reasons Why “Do It Yourself Braces” Is a Bad Idea! These days, there’s a DIY (do-it-yourself) version of everything. Want to make your own table decorations for a party? No problem! Maybe you want to build yourself a wooden shed? You can find instructions for that online. But even if DIY is a great idea in some situations, it can easily be taken too far. Orthodontics is a great example! Believe it or not, some people are attempting to straighten their teeth at home by using rubber bands, jewelry beads, paper clips and even super glue. The idea of straightening your own teeth sounds really tempting, but when you hear the following six things a dentist has to say on the matter, you might just change your mind! Your tongue, lips and teeth all work together to produce the sounds you make as part of your normal daily speech. When you move the position of your teeth, you change an integral part of the way you talk, which can cause major speech problems down the road. There’s nothing worse than feeling hopeful and excited about getting something you’ve always wanted (i.e., straight, even teeth) only to be let down when it doesn’t work out the way you planned. 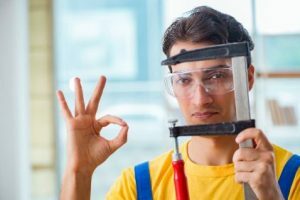 Why not get the job done right the first time by a dentist and spare yourself the emotional turmoil of feeling disappointed from a DIY method? Your gums are the foundation of your smile. Moving your teeth into new positions too quickly can cause cuts or gum infections that can become serious if left untreated. When a professional straightens your teeth, there’s no risk to your gums at all! Since DIY braces rarely work and can actually damage your teeth, you can wind up paying more in the long run to fix the problems created during the DIY process! If you’ve ever had a rubber band around your finger for too long, you know that the blood supply is cut off pretty quickly! A similar scenario can cause severe damage to your teeth, resulting in the need for extractions. Dentists go through many years of training to make sure that they know how to move your teeth properly. A big part of this is making sure your teeth stay in their new positions! With over 40 years of experience as a general, restorative and cosmetic dentist, Dr. Larry Young has made trust the foundation of his relationships with his patients. That’s why he always evaluates each DIY treatment he hears about so he can make sure his patients only get the best results. If you have any questions, he can be reached via his website or at (904) 731-9833. Comments Off on A Dentist Gives 6 Reasons Why “Do It Yourself Braces” Is a Bad Idea!